Viktor Stepanovich Chernomyrdin is an outstanding statesman, public figure and diplomat. He was the Minister of Gas Industry and the first Chairman of the Board of the State Gas Concern "Gazprom". He was also Minister of Russia, Ambassador Extraordinary and Plenipotentiary of the Russian Federation to Ukraine. He was a Presidential Advisor of the Russian Federation, Special Representative of the President on economic cooperation with the CIS member states. V.S. Chernomyrdin was awarded the Orders of Merit for the Fatherland of I, II, III and IV degrees. 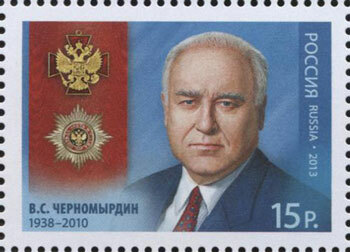 The postage stamp depicts a portrait of V.S. Chernomyrdin, a sing and Star of the Order of Merit for the Fatherland of I degree. The illustrated cover is prepared to the issue, inside of it there is a sheet of stamps and the FDC with cancellations.